K0003A Les sables. Oceanfront Condo, spectaculaires levers de soleil, Piscine communautaire! Réveillez-vous à un lever de soleil spectaculaire de ce condo Oceanfront premier étage. Profitez de superbes vues sur l'océan depuis votre balcon privé meublé. Près des magasins, des restaurants et des activités. Piscine communautaire, barbecue et 2 laveuses / sécheuses communautaires, douche extérieure. Meubles de pont. Plage surveillée en saison. Pas d'animaux de compagnie. Accès Internet WiFi, 3 télévisions par câble, lecteur DVD, chauffage central et air, lave-vaisselle, micro-ondes, ventilateurs de plafond, non-fumeur. 5 mètres de la plage. Milepost 7. This was a great place to stay! We enjoyed how close it was to the ocean. The people were friendly. It was a close drive to restaurants, stores & attractions. Had 2 community washer & dryers that did not require money. We are happy to hear that you were pleased with the vacation rental home you and your family occupied in June. The room was clean and updated. It was very convenient being on the first floor. 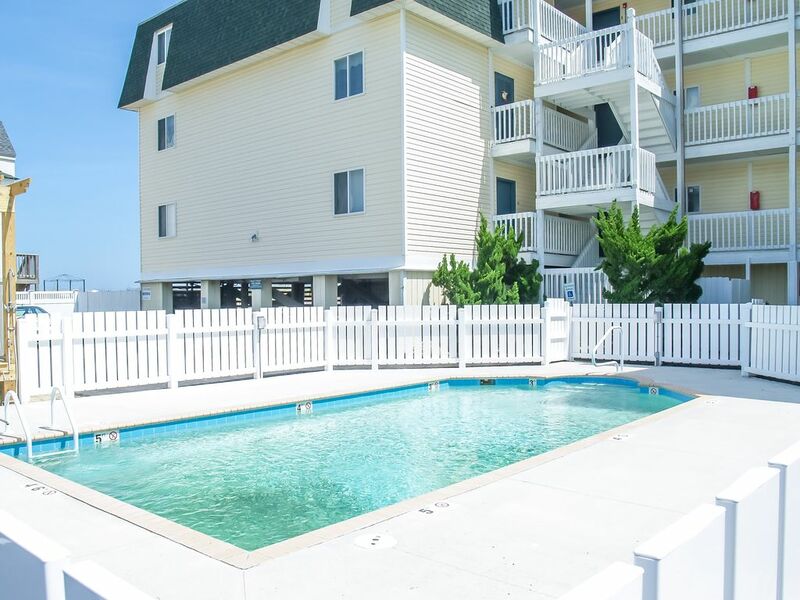 Only a few steps away from the beach and the pool. You can’t beat the view of the sunrise from the balcony. I’m looking forward to staying here in the future. We are happy to hear that you were pleased with the vacation rental home you and your family occupied in September. Overall experience was great, Beach Realty was easy to deal with and provided a user friendly web site which I completed all my reservations, payments and confirmations. This is our second time renting unit 3A, the unit was recently remolded with everything new, location is great being around the corner from grocery's, restaurants, and shopping. I would recommend this unit as this was my second time renting and will certainly stay here again next year. The owner takes pride in providing their guests the best experience and I am sure they will love to hear that you had everything you needed. Love the location. Condo very clean. This was our 3rd time in this unit. We definitely would stay again. Kenneth, thank you for sharing your experience with us! We are so glad you keep coming back. We hope to see you again soon! The unit was exactly as it was advertised in the photos, but the photos really doesn't do justice to unit! It was very clean, and the decor is beautiful with warm rich beach colors, you can set on the deck and watch the sunrise over the ocean. Robert, thank you for sharing with us! We are so glad you enjoyed the property, and we hope to see you again soon! Beautiful! Steps from the beach. Easy access to Condo on first floor. Clean and lots of Kitchen accessories. Nice artwork on the walls. Food Lion just 3 blocks away. All was good! Alan, thank you for sharing your experience with us! We are so glad that you enjoyed the home. The owner will be happy to hear it. We hope to see you again soon!